Let’s take a break from long range finesse shots and take stroll down FIFA memory lane. Hey comrades, let’s take a break from FIFA 19 for a hot minute and take a look at the past 13ish years of FIFA! So much of the game is rooted in the series’ legacy, and it’s interesting to compare experiences. Although the games have technological advances in crazy ways, does that mean the games have gotten more fun? That’s debatable, so let’s take a look! 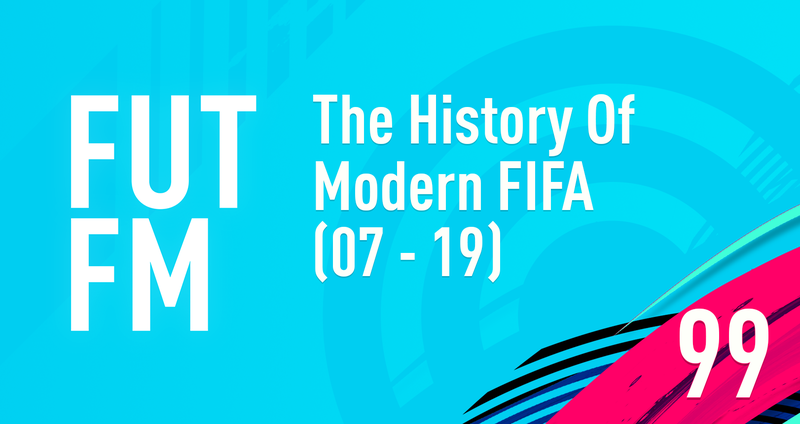 Be sure to listen to the full show to hear both of our takes on FIFA throughout the years! In this article, I’m focusing on briefly summarizing my own thoughts because I don’t want to speak on Valerio’s behalf. FIFA 07 was the first “next gen” title of its era. It changed FIFA forever with a brand new engine that tried to simulate real football, ai, physics, ball movement, and so much more. It was also an unfinished product that lacked major content. You only had something like 6 leagues and expected modes were not present. The game got terrible low 70s reviews, but as a long time PES and FIFA player, the potential here was obvious. Clearly they took the hit here in order to build a new platform for the next generation. Despite the game feeling clunky, you just had to marvel at the potential that this new world of video game football had in store. Would I recommend the next gen version of FIFA 07 at the time to people looking to spend $50 on a footie game in 2006? Hell no. Do I appreciate what it did for the franchise? Hell yes. With FIFA 08 being a complete game running on new tech, you felt like the series was starting to rival PES in terms of gameplay. The improvement from 07 to 08 was massive, but it was still too arcadey and the right still wasn’t quite what you wanted it to be. I scored an insane amount of rebound goals that year, it was a bit bizarre, but it was a lot of fun. Now we’re in FIFA 09, and you can definitely make a legitimate case for it being better than PES. With more robust animations and movement, it built on the success of FIFA 08 with a new collision system and 10v10 online play. FUT also showed up as a paid downloadable mode. That brings us to FIFA 10, aka the undisputed king of FIFA. This game revolutionized the series and finally overtook PES in terms of gameplay quality. FIFA 10 gave us 360 degrees of motion for the first time in a football video game. If you’ve never tried an older FIFA or PES game… give it a shot. You’ll instantly note how severely limited your mobility is. FIFA 10 was an incredible breath of fresh air. It brought fluidity to the game that we’ve never seen before. It was full of long shot finesse spam, ping pong passing, and high pressure, but you could combat it. Although it wasn’t much of a simulation, it was a lot of fun to play to its match flow. FIFA 11, 12, and 13 kind of blur together for me. I know during this time tactical defending was introduced (12 I think) and FUT was no longer a paid expansion (also 12 I think). But after the revelation of FIFA 10, these games saw some diminishing returns. The leaps they were making weren’t insanely significant, it was more like a refinement on a successful formula. I played these games a lot but despite everything they’ve improved, they don’t hold a powerful memory in my mind. One thing that stood out was the Impact Engine in FIFA 13. It led to insanely unrealistic collisions which were very frustrating. As a result, ball behavior was tricky to predict and led to annoying bounces. You can view FIFA 10, 11, and 12 as a trilogy with diminishing returns, and 13 is kind of the start of something new. FIFA 14 gave us XBOX Legends (precursor to Icons) and was full of pace/cross abuse. It wasn’t a great time, but there was still a lot to like about the game. The potential was still there. By the way, pace abuse didn’t really get solved until FIFA 18, (or arguably 17 and 19 depending on your take). FIFA 15 is another one of those “don’t have much memories of this” game. I could be misremembering, but this might’ve been the game in which people we upset by the passing/first touches being difficult. Or maybe that was 16. Anyway, 16 is my least favorite FIFA for sure. It was geared towards skilling with the right stick, and with a little bit of practice you could dribble out entire teams. The near post finishing was super OP, and I took many breaks from this game. FIFA 16 also introduced FUT Drafts. For me, FIFA 17 was better than 16 for sure, but it was marred by input delay. I could barely get it to work right. The new Frostbite engine seemed to not really make a difference at the time. 17 gave us a renewed focus on the competitive aspect of the game, which in turn led to more people exploiting mechanics than ever before. The series still struggles with this. FIFA 18 was a game dominated by driven shots and random bounces. It often felt like things were out of control. I’m not sure that I need to say much more since FUT FM has been around the 17 days, so our thoughts are well documented. As I wrap this up, I remain hopeful that the upcoming FIFA patch fixes finishing and general match flow as a result. If it doesn’t, it’s going to be a long 7 or 8 months until FIFA 20. Don’t forget to subscribe to the #1 FIFA podcast on Apple Podcasts/Google/Spotify so you don’t miss the latest episode. Cheers!